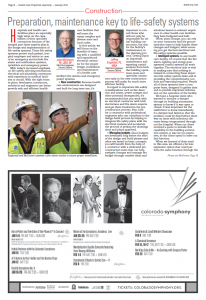 Encore Electric project engineers John McGovern and Jeffrey Engelstad recently wrote an article that was featured in the January 2019 edition of Health Care Properties Quarterly, a publication from the Colorado Real Estate Journal. In the article, they discuss life-safety systems, especially in hospitals and healthcare facilities. They touch on new construction, intelligent systems, managing budgets, conformance with state and local fire laws and finding the right partner for the job. “With today’s increased emphasis on life safety, selecting mechanical, electrical and plumbing contractors with experience in medical facilities is crucial. With the right team in place, developers, contractors, architects and engineers can better provide safe and efficient healthcare facilities that will meet the many complex and diverse state and local codes,” they say.